As believers we have the responsibility to reach out to those that are lost and win the world for Jesus Christ. But, how do we view those that are lost? Do we condemn the unsaved before we even begin to witness to them? 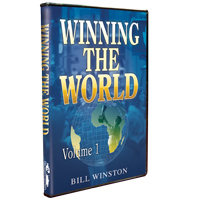 In Winning the World, Volume One, Dr. Bill Winston shares how critical the revelation of the love of God is to winning the world for Jesus Christ. In this series you will learn that how you view yourself will determine how you view others, why God so loved the world, Christ does all of the work, and much, much more! Jesus came to save the world, not to condemn it. And as His ambassadors in the earth, we must share the same caring and loving heart that Jesus shared with a hurt and dying world. Let the revelation shared in this series forever change how you view yourself and ultimately how you view those around you as you learn how to Win The World for Jesus Christ!